An Xbox 360 with a Kinect motion sensor for just $99? Yep, it’s for real, but there’s more to the story. Yesterday morning we told you this offer was on the way. 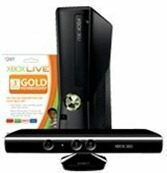 The 4 GB version of the Xbox 360 with a Kinect motion sensor normally retails at $299. With this new offer from Microsoft, shoppers can get the bundle for $99 up front… but only if they also sign up for a two year Xbox Live Gold membership. The membership subscription costs $14.99 per month. The deal is not available online. At least not yet. According to Microsoft’s website, it’s only offered at Microsoft stores. They have posted a coupon for the deal here. A list of Microsoft store locations is here. Microsoft has set this offer up to be very similar to the way cell phones are sold through carriers. The shopper gets a discounted (or ‘subsidized’) price for the device in exchange for signing a contract for ongoing service. Like a cell phone contract, Microsoft imposes an ‘early termination fee’ (ETF) if the contract is cancelled before it’s term runs out. In this case, Microsoft charges an ETF of $250 if the Xbox Live Gold membership subscription is cancelled within the first three months (though they do offer a 30-day return policy – minus the non-refundable first month subscription to Xbox Live Gold). After that first three months, the ETF is reduced on a sliding scale, from $240 if membership is canceled in the fourth month, to $12 if cancelled in the twenty-third month. Will you be taking advantage of this new offer from Microsoft? Let us know in the comment section.